Brazing Fluxes are essential to virtually all air brazing processes. It is vital that the correct flux is used, combined with the correct application technique and a compatible filler metal. When choosing a flux, it is important to take into account that it should be active from 122 °F (50 °C) below the solidus temperature of the brazing alloy to at least 122 °F (50 °C) above the liquidus temperature of the brazing alloy. This ensures that the flux is effective during the entire brazing operation. Using inadequate flux or poor application techniques can dramatically interfere with joint quality. 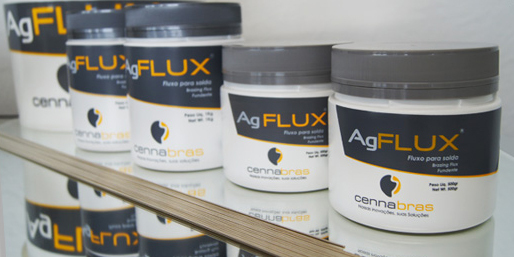 Cennabras produces a range of fluxes suitable for most brazing processes, parent metals and brazing alloys. The formation of oxides accelerates as the parent metals and brazing filler metals are being heated due to a combination of hot metal and oxygen in the air. These oxides must be prevented from forming otherwise they will inhibit the brazing filler metal from wetting and bonding the surfaces. Coating the joint area with flux will prevent oxide formation during heating and will allow the molten brazing alloy to wet and flow over. Fluxes are not effective when used on parent metals containing oil, grease and/or other organic residues. It is important that the surfaces of the joint are clean.